How are stories planned and organised? More interestingly, how have they been arranged in different parts of the world and times in history? Today I want to talk about a common middle eastern pattern, “ring structure”. Nowadays, the pattern most commonly talked about is called “three act structure”. Some people use this title just as a convenient piece of shorthand, but others try to argue that there is something fundamental about it, even to the extent of suggesting that there is some basis in human brain chemistry that favours it. Three act structure is pretty much stock in trade for Hollywood films and so has big money behind it. Basically, 1) the plot presents a problem to the main character. A first attempt to solve it fails. So 2) a more elaborate attempt to solve it is set up and also fails, this time in such a way that things look hopeless. Then 3) a final sacrificial attempt is made and it is resolved. But is there really anything profound in this pattern? I want here to distinguish between film plots and book plots. These are different media and so might quite reasonably have different forms – why should a film follow a book storyline any more than if the key plot ideas were turned into a musical, or a poem, or a piece of art? However, typically, people who know a book well routinely end up disappointed with a film adaptation. Now, despite some of the things which have been said about it, there is no real reason to suppose that having three acts mirrors anything deep about the human soul. Many pieces of literature have used entirely different patterns, and I want to focus on a few of these over an intermittent series of blog articles. So for today, I want to look at ring structure – the key moment or event is placed in the middle of the work. It is, quite literally, pivotal, or centrally important to the plot. Bailey, back in the late 1990s, said of this pattern “The primary language of the picture is placed in the climactic center. Around that center is a series of interpretive semantic “envelopes”, which provide direction to the reader’s imagination“. On similar lines, Radday said “Chiastic structure… is more than an artificial or artistic device… it is rather, and most remarkably so, a key to meaning“. In the ancient near eastern world this pattern was common, and it has survived to some degree through to the present. The typical pattern is to open with a state of stability and peace, which is then disrupted in some way – perhaps by a natural crisis, or by wickedly motivated individuals. The disruption may be presented from several different points of view, depending on the length of the work. The pivotal event is at the centre to resolve the crisis – in some texts it might be a battle, for example, but in others it will be a celebration of a god, nation or individual. Merenptah’s Israel Stele has “A great wonder has occurred for Egypt“. The Hebrew “Song of the Sea” (Exodus 15, first half) has “Who like you among the gods? Yahweh!“. After the central affirmation the situation ‘unwinds’, commonly in symmetric ways to the opening layers, and the setting is restored to peace and stability. 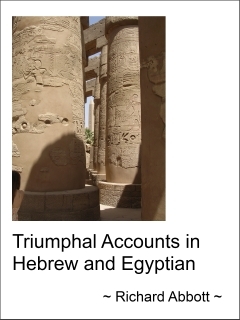 A few years ago now I made a study of this in the PhD thesis Triumphal Accounts in Hebrew and Egyptian. In this I showed how some key texts in New Kingdom Egypt and the oldest strands of the Hebrew Bible use ring structure, and its stricter cousin chiasmus, to provide the framework for their narrative. But use of the pattern is not restricted to the ancient world, and it was in use in rural middle eastern contexts within living memory. Some people have argued that it reflects a difference in world-view. Three-act, credibly, lends itself to a conquering, pioneering mentality in which obstacles are only there to be surmounted in pursuit of a supreme goal. Ring structure lends itself to a view which values cohesion around a crucial centre. Perhaps it is not surprising that Hollywood likes one and not the other! Some modern authors have experimented with this pattern, such as Hemingway in The Sun also Rises. There are even elements of the ring structure in the typical Star Trek (original series) plot, when Kirk, Bones and Spock collect on the bridge on a wind-down return-to-normality session after saving the world again. On a more domestic scale, I built In a Milk and Honeyed Land according to the structure: readers can entertain themselves working out the key events which I have set as the pivot, and how concentric patterns are set up during the book as a whole. With influences from world literature increasingly impacting on British and European fiction (from what I have seen, America lags behind a little here), it is to be hoped that ring patterns will come back into larger scale use. They provide an interesting and creative variation of plot structure, and potentially say something important about a world view. Literally dozens of settlements of varying sizes were burned and the inhabitants scattered, all within what seems to be a time span of 30 or 40 years. . 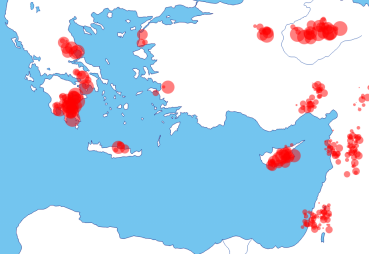 In some cases the places were resettled not long after, but in others the abandonment was longer term – for example Ugarit was never resettled, and was lost to memory until recent times. The archaeological evidence is not exact enough to say that all these destructions had the same cause, nor the sequence in which they happened, but he argues on both logical grounds and from the Egyptian texts that the movement was north-to-south. The destruction pattern washes around but does not really touch the southern hill country of modern Israel and Palestine, and he specifically mentions Jerusalem and Gibeon as places which were untouched. This is handy for my overall storyline, as these places – under the names of Shalem and Giybon – feature strongly. Drews’ overall question is, I think, fascinating. The destruction of cities and palaces, whilst always terrible for the occupants, often does not signal major social change or the collapse of the culture – in many cases the destruction spurs off a new flourishing of building work and other cultural activities. But all around the Levant these events were truly catastrophic. The Bronze Age social structures and connections collapsed, and were uniformly replaced by other forms. Why should this have happened? I have not yet read far enough to see what his answer is, but since he is an advocate of the ‘new military technology’ approach, my guess is that he will suggest that the new styles of warfare swept the former military elites away. This would make the change comparable in some ways to the demise of the mounted armoured knights of the medieval period. The advent of the longbow and then gunpowder not only changed the course of battles, but also signalled much wider social transformations. When the dust of the 1200 BCE catastrophe had settled, the new kingdoms that arose all around the eastern Mediterranean were built on different principles. 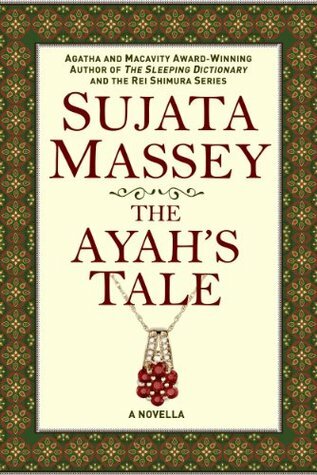 I found The Ayah’s Tale, by Sujata Massey to be entirely captivating. After what has been a dry patch of slightly disappointing books, here at last was another five star read. The Ayah of the title actually relates two different tales. The frame is set in 1950s Malaya, where Menakshi is an adult with children of her own. Inside that we are transported to pre-independence India of the 1920s, where she is Ayah (guardian/governess) to the young children of a high ranking British family. Part of my motivation to read this book was a desire to encounter India through fiction as well as through daily contact with team members at work. The Indian voices in the book – Menakshi herself, as an intelligent and emotionally perceptive young woman, her friend and supporter Ram, and others – were immediately familiar to me. In 1920s India these people were trapped within the constraints of a social system which denied them opportunities to reach anything like their potential. A few Indians were starting to cross the social divide in terms of wealth and access to resources, but the vast majority could not move out of the circumstances of their birth. The British voices are diverse, blending the unthinking arrogance of some with the kindness and compassion of others. For the children Menakshi cares for in the household, there is a gradual dawning of awareness of the realities of their family life. Some passages make for very uncomfortable reading for a Brit, along with a sense of relief that the underlying attitudes of assumed superiority have been considerably eroded since those days. It is, after all, nearly a century since the experiences of Menakshi’s youth. The tone and vocabulary of the book make this accessible to young people as well as adults. However, it would take a certain level of maturity to be interested in the story line, and sensitive to the inter-personal dynamics. For those many of us who have no personal memory of the period of British Empire, it is a useful and timely reminder of what our nation took away from other countries as well as gave to them. But the focus of the book is not really on the dark side of British rule, but rather on the Indian potential for growth, and the ability to face challenges and rise above them. The final chapter, closing the 1950s frame, is a beautifully crafted piece which both tidies up the plot line and also leads you to rethink what has gone before. Sujata has given us a fine example of how to use this particular structural device to conclude a story. All in all, a great book which I have thoroughly enjoyed reading. In case there was any doubt… five stars from me. This was another selected item at the book club I go to, and in stark contrast to the previous choice (The Garden of Evening Mists – which I reviewed on January 5th this year), I found The Last Caesar to be a profound disappointment. Henry Venmore-Rowland had, I think, carried out a considerable amount of background research, but the end result was, to me at least, rather uninteresting. Most of the book could easily have been presented as a wiki entry or series of blog posts rather than a historical novel, and there were very few places where I had a sense of a unique insight into the past. The writing is solid and uninspiring rather than delightful or poetic. Conceivably this reflects The Roman Way of Life, but I have read other books set in the classical period which have managed to portray a lighter and more delicate world. This story is set in a turbulent year, when the family line of Augustus Caesar spluttered to a halt with Nero. This triggered a struggle between several contenders for the imperial mantle, and the main character in this story – Aulus Caeccina Severus, apparently loosely based on a historical individual – is part of that struggle, supporting one or other faction in turn as his own ambitions and anxieties indicate. 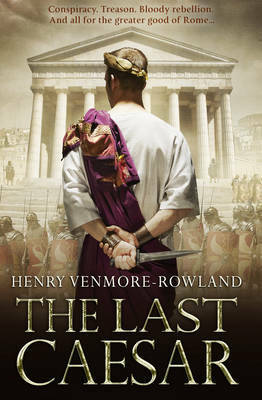 But do not be fooled by the title – the book is neither about the last emperor of Rome (which one might have thought), nor Nero himself (who technically was the last member of the Caesar family). Severus appears to be at best a marginal figure in the imperial struggle and spends the whole book in the provinces and nowhere near the heart of the action in Rome. The front cover image has essentially nothing to do with the story but has the appearance of a boilerplate Roman image from a photo stock agency. To my eyes the fictional Severus is a rather improbable figure, who succeeds in regularly rising above a whole series of problems and challenges without too much difficulty. This causes a mixture of admiration and envy in other people, but incredibly the surrounding characters who might have most reason to distrust or turn on him inevitably accept his unlikely explanations and receive him back into their collective fold. His chief flaw is a rather unwavering trust in his superiors (until they betray him), which leaves him vulnerable to their machinations. That book is totally dominated by male characters. The few women who appear are either buxom, conveniently available tavern wenches of uneasy virtue, or else extraordinarily beautiful wives, typically with slightly sinister ambitions. The overall effect is to give the impression of a laddish game being played out without feminine counter-balance, and without any real concern for the human impact following on from the rough and tumble. Again, this might possibly be a fair reflection of the Roman world, but it left me cold. The Last Caesar also stops quite abruptly, and you discover a page or two from the end that actually you only have half a book in your hands. The story continues in another volume (The Sword and the Throne), but I have not been wooed into acquiring it and will cheerfully let the story remain unfinished. Readers who like Roman history might possibly get more out of this than I did. Or maybe readers who like books which don’t involve women to any real degree. If you like subtle books with a good balance of the sexes, or writing of flair and beauty, it would be well worth looking elsewhere. For me, it just didn’t work as a book. I am, however, prepared to give it three stars despite all this, because it was well researched, well produced and friends who know the period assure me there are no glaring historical errors. Mistress Angel, by Lindsay Townsend, was one of those “if you liked this then you might like that” recommendations for me. In fact I didn’t really enjoy this book, mainly I think because I am too serious a reader of historical fiction to warm to its approach. Readers should be aware that this is essentially a light romance, which happens to be set in the past. Take it on that level, and if you like romances then this might be for you. But if you are wanting to immerse yourself in a past era, full of details and people unique to that time, perhaps another book would be better. The story itself is straightforward. A young widowed mother is exploited by her guardians, and is rescued by a coincidentally widowed eligible young man. Characters are pretty much black and white, and change little during the plot. The historical elements come in predominantly through the social setting – guilds, horses, blacksmiths, processions and the like. The couple themselves are of high enough rank that they can challenge the system successfully, but not so high that their actions are in any real way constrained by social convention. The consummation is obvious from the first time they meet, and the only complexity is how the male half is going to be able to sort out the potentially destructive legal backlash. However, he happens to have plenty of money, good friends, and considerable knowledge of a bunch of disparate but pertinent facts. One of my biggest complaints is about the length of the book. The kindle progress bar makes it look as though the story is of a typical length. However, it stops at 62%, and Lindsay has filled the rest up with short extracts from no less than six other books. Regardless of my feelings about Mistress Angel, I felt slightly cheated by this. On the other hand, the book is very economically priced. For me, three stars. It lacked most of the things I enjoy in a book, and the snippets from quite different stories could not make up for the abrupt end to a very short book. Worth checking out if you like short romances with a thin layer of historical setting. 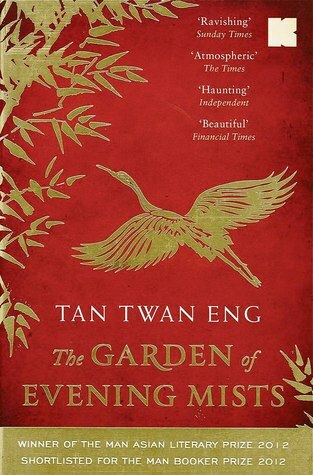 I was introduced to The Garden of Evening Mists, by Tan Twan Eng, at a book club I frequent. I have enjoyed a good fraction of the books we have selected there, but this was the first one I thought was beautiful. Well-researched historical fiction often ends up being thorough and workmanlike, rather than elegant or stylish: this book definitely bucks the trend. It is clear from comments at the book club, and those of other reviewers, that many people have disliked the deliberate ambiguities of time and memory in which Eng delights. The book shifts frequently, even within a chapter, often without overt clues, between several time periods in the life of the central character. The uncertainty is strengthened since she is also struggling with progressive memory loss as she ages, and has an understandable and deep-rooted desire to keep certain episodes concealed. Themes of both ordinary and wilful forgetfulness thread through the book, and the author plays his own part in this by refusing to give some issues the prominence which in inter-personal or plot terms they probably deserve. This book invites the reader to engage carefully and deeply. Superficially the book is about the garden of the title, but both the garden itself and the act of designing it are used as metaphors of personal and social transformation. The garden, the gardener, the novice herself, and the various other people living nearby, all hide important issues within a facade of surface detail. The Second World War and its aftermath was experienced very differently in south east Asia as compared with Europe, and the tensions and traumas of those years have left indelible marks on the people and the land. 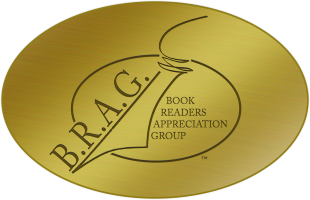 They emerge in the lives of the characters of this book. For me The Garden of Evening Mists was without doubt a five star book, and one which has continued to exercise both my imagination and family conversations for many weeks. However, it is clear that it will not appeal to all comers. If you are looking for an action book, or one in which the story flow is clearly signaled and unambiguous, you will not find it here. However, if you like exploring the psyche after it has survived trauma, and do not mind coping with the indeterminacies of memory leading you to and fro in time, this could be a great discovery.